The slime craze continues and so many people are having fun making slime! 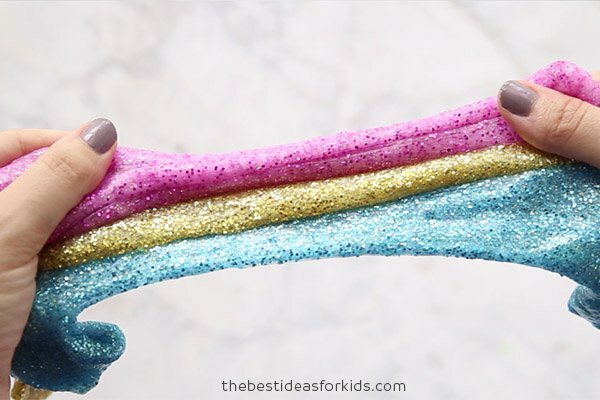 Not only is slime fun to make – but kids will love stretching and squishing it. You’ve probably heard of all the slime fails. Well you’ve come to the right place for an easy slime recipe. Our favorite slime recipe is made with contact lens solution. It’s the easiest we’ve tried and without borax. So you won’t have to worry about slime fails with this one! Be sure to read the full post and tips below on how to make slime with contact solution! There are a number of different slime activators you can use to “transform” your glue mixture into slime. Contact lens solution is our favorite activator. You can also replace this for saline solution, but just make sure that that they contain boric acid and sodium borate. Why is boric acid important for slime? Boric acid is made from borax and similarly liquid starch contains sodium tetraborate which is also made from borax. Typically all activators have some derivative of borax. However, we prefer using the contact lens solution as it’s easier to use and more widely available (liquid starch is not available in Canada and Borax is not available in the UK). This Renu Fresh Contact Lens Solution is one of the recommended brands we suggest since it contains both boric acid and sodium borate. This easy 3 ingredient recipe is such a popular one! 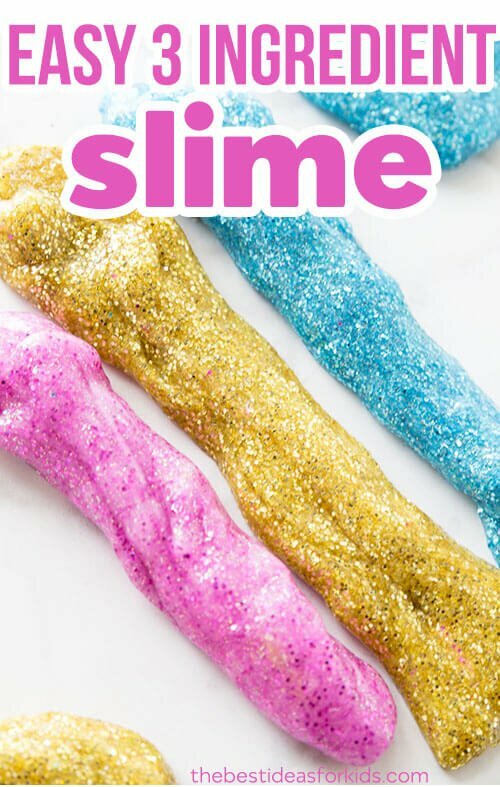 If you haven’t seen our Unicorn Slime made with it, head over to watch the video on how it’s done! 1. 1 Bottle of Elmer’s Glue (6 oz) – we like to buy the gallon size and then measure out for savings. 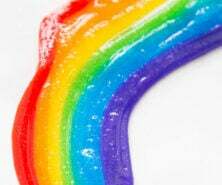 If you want to get a similar effect to the photos in this post, you’ll need to buy Elmer’s glitter glue and review our Unicorn slime recipe. We recommend Elmers as it has been tested and is quality glue. Do not substitute any ingredients as your slime may not work. 3. 1½ TBSP of Contact Lens Solution – Renu Fresh or Equate are both good brands which contain Boric Acid and Sodium Borate. Do not substitute for other brands. 4. 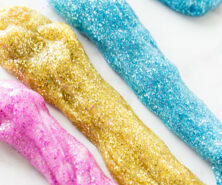 (Optional) – Add 2 TBSP of water (up to 1/4 cup) if you’d like a stretchier slime. 2. Pour your entire 6 oz Elmer’s Glitter glue into the bowl. 3. Add your 1/2 teaspoon of baking soda and mix in thoroughly. Also add 2 TBSP or more of water here (up to 1/4 cup) if you want a stretchier slime. 5. Slowly add in your contact lens solution (reminder: your contact lens solution should contain boric acid or your slime will not form). Add it in slowly and mix if possible so that you can adjust and ensure you do not add too much. We like to add a few teaspoons at a time and then mix. Knead and mix thoroughly before adding more as you do not want to add too much or your slime will get too hard. You may not need the full amount so take this step slowly. 6. Now mix until your slime forms and begins to harden. Take it out and knead, knead, knead. You may be surprised how much you need to knead to really make the slime form. If it’s not the desirable consistency keep kneading. If you find it to still be too sticky, add a little bit of lotion or baby oil to your hands. 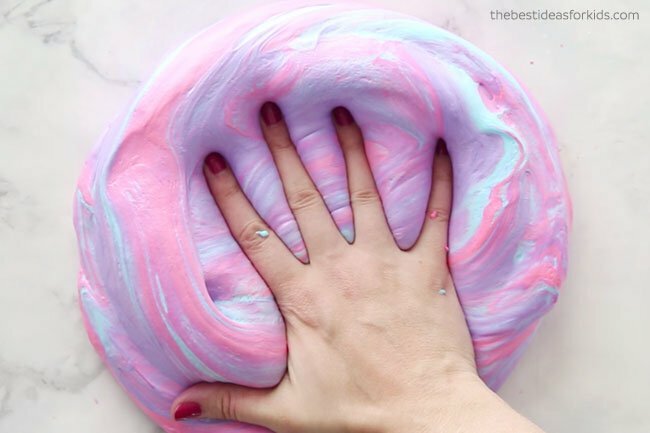 Watch our Unicorn Slime tutorial video here before you get started! 1 TBSP Optional - Add 2 TBSP to up to 1/2 CUP of water if you'd like a stretchier slime. 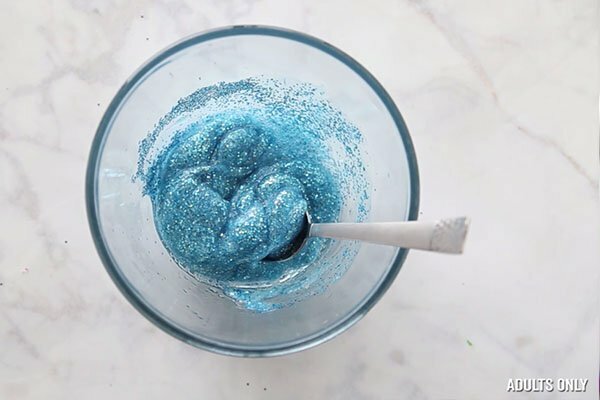 Pour your entire 6 oz Elmer’s Glitter glue into the bowl. 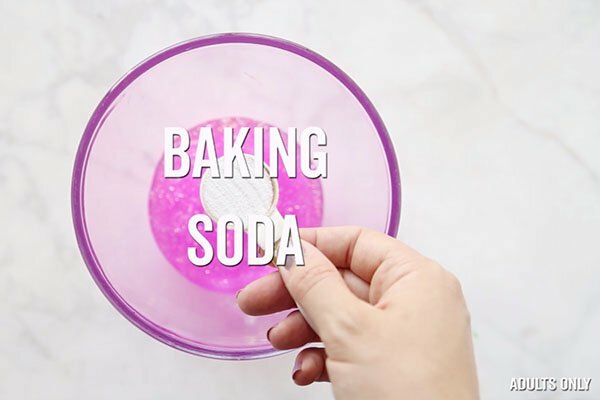 Add your baking soda and mix in thoroughly. Also add 1 TBSP or more (up to 1/2 cup) of water here if you want a stretchier slime. Slowly add in your contact lens solution (reminder: your contact lens solution should contain boric acid or your slime will not form). Add it in slowly and mix if possible so that you can adjust and ensure you do not add too much. You may not need the full amount so take this step slowly. Now mix until your slime forms and begins to harden. Take it out and knead, knead, knead. You may be surprised how much you need to knead to really make the slime form. If it’s not the desirable consistency keep kneading. If you find it to still be too sticky, add a little bit of lotion or baby oil to your hands. We hope this easy to follow recipe on how to make slime with contact solution has been helpful! 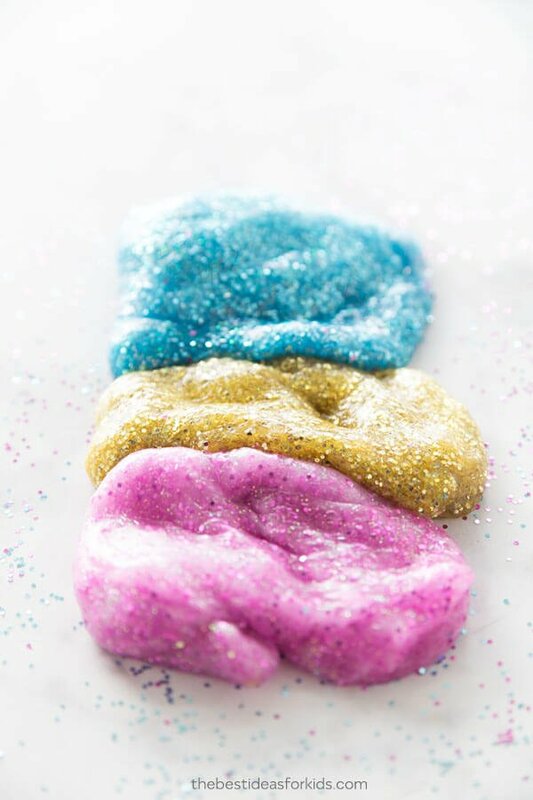 Head over to our Unicorn Slime page to see how you can turn this into Unicorn Slime! 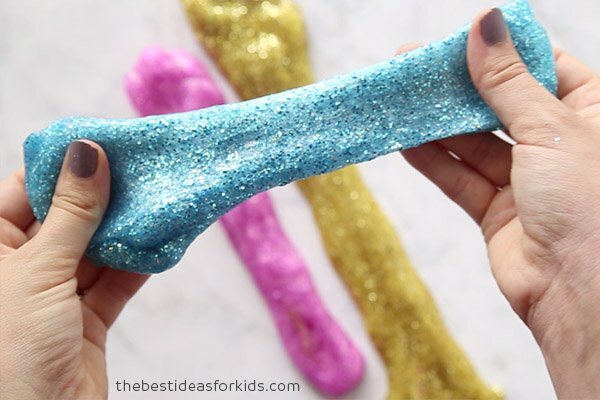 Make Fluffy Slime which has a different texture and is fun to play with! See our Fluffy Slime Recipe. 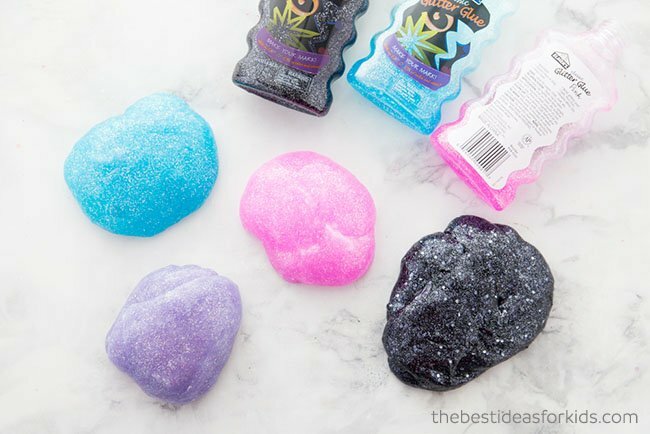 See how we turned these 4 slimes into Galaxy Slime! This one is really fun to mix! Can I put homemade salin solution in slime. I was going to make saline solution it’s just a little salt boiled in some water I’m going to make this with preschoolers I would like it to be chemical free. No you cannot use homemade saline solution. If you are buying saline solution it needs to have boric acid in it for the slime to form. How much slime does this make? 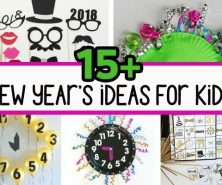 Wanting to make it for a class party! This recipes makes enough for 1 batch which is 1 bottle but that can be easily split between two kids. how can we make this strechier? Add more water (just try a tablespoon at a time) and less contact solution. Add your contact solution in slowly and then knead as much as you can. Then only add in 1/2 teaspoon at a time until it’s not sticky but as stretchy as you’d like it to be. Thank you so much for the tips on the contact lenses solution! We tried with one solution and the slime couldn’t form. Then I googled and came to your site where you specifically mentioned that the contact lenses solution must contain sodium borate and boric acid. We changed the solution and it worked! Thank you so much!